Hello, dear readers and followers of Joy's Joy~Ful Journaling! She made it ~ She's here ~ and yes, She brought Kaydie with her! What a morning this has been, but gracious, loving, Penny - my dear friend - has given me such encouragement, made the morning sing with some laughter after the tears! Thank you for stopping by on your busy blog tour ~ thank you for bringing Kaydie with you! How about a brief bio to introduce you better than I can? "A DAY IN THE LIFE OF A WIFE, MOM, AND AUTHOR"
Joy, Thank you so much for allowing me to be a guest on your blog. What type of work did you do before you were a writer? I have worked in the past in a branch of social services as a counselor. I have also worked as a legal assistant, bank teller, retail clerk, aerobics instructor, bookkeeper and administrative assistant. My favorite jobs of all are being a wife to my husband Lon and a mom to our two children. I love being a writer and I feel blessed and humbled that God has called me to write. What writing goal have you set for yourself that would be the most rewarding to achieve? My ultimate goal is that a reader's life would be impacted for Christ through one of my books. What lessons have you learned through the publication process that you wouldn't have guessed as a pre-published writer? That the hardest work comes after the book is published. Any funny family stories about living with a writer? Actually, yes! One evening, I sat perched on the staircase in our house, watching for my husband, Lon, to come home from work. He was scarcely through the front door when I began tugging on his arm. "Is everything ok, Pen?" he asked me. After 18 yeas of marriage, he knows about my exuberant, creative, and at times, far-fetched personality. "Yes, yes, it's fine. I can't wait for you to meet Lucille Granger!" "What? Lucille Granger?" Lon looked at me. "Do we have company?" I shook my head and laughed while leading Lon up the stairs and into my office. When he saw me point for him to sit in the blue, "guest" chair in the office, he nodded his head knowingly. He'd been in the blue "guest" chair many times before. Yep, it was making sense to him now - Lucille Granger wasn't someone visiting for dinner. She was secondary character in all three books in my Montana Skies Series! No charities, savings or gifts? What about paying bills? *grins* Wow! That's a hard question. Hmmmm. . . I would take my family on a vacation or buy my husband flying lessons, since it's always been a dream of his to learn how to fly. And if there's any money leftover, I'd probably buy a cute new outfit since I love clothes! Okay, here's a different subject ~ What is your favorite verse in the Bible? What event in the Bible would you like to be at? It can be in the past or in the future. That's a great question, Joy! I can't narrow it down to one event. I would say that it would have to be a three-way tie between the days of Creation, Jesus' birth, and the Transfiguration. Penny, your most recent release is a historical fiction romance, titled Kaydie. Do you write novels exclusively? Kaydie was released just this month and is Book 2 in your Montana Skies Series. Can you please give us a brief synopsis? 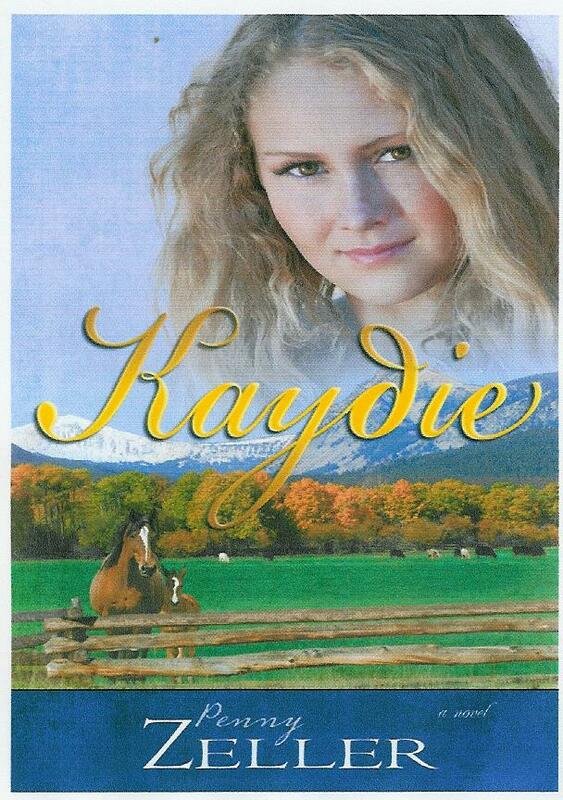 Where can readers purchase a copy of Kaydie? What do you hope your readers will get out of the story? Writing is my ministry and I hope my readers will get from Kaydie - and all of my novels - the power of God's love, redemption, hope, and forgiveness. And that God can and does change hearts. Penny, what's up next for your readers? I just finished the third and final book in the series, Hailee, which is scheduled for release in September. I'm also working on a second historical romance series that takes place in the Post-Civil War Era. I recently finished book one in the series and have started writing book two. Any parting comments before you leave us for your next stop? First, I would like to again thank you, Joy, for having me as a guest. Second, I would like to let everyone know that my official blog tour for Kaydie is from April 1 - May 15. I will have all the details (including a chance to win Hailee, the third book in the series) on my FB author page, so be sure to stop by! It's the beating of the fingers against keys on the computer keyboards as our readers rush to get that chance! Penny Zeller's work. She is a fine Christian first, great mother two those precious little ones and of course, a wonderful wife but you know, God put some very nice talent in that little package called Penny and has allowed her to write for Him as well. May God bless you, Penny as you continue to serve Him with your written words and your very real heart of love for the souls of others. I need to apologize here to Penny and to my readers. This post was to have published by 6AM on April 19th. I am so sorry for any inconvenience this may cause you, my faithful readers. It also appears that the spacing refuses to be saved as I planned and the colors have been changing as well. It would be interesting if it wasn't so ANNOYING! I want to thank you for coming today. I especially want to tell you how very much I appreciate your friendship, your gracious attitude when the blog and it's author seem to be out of sync. Kaydie was a special book and I HAD to put it on my keeper shelf in my personal library. I have granddaughters coming up that will enjoy your books and McKenzie has been gracing the shelf just waiting for Kaydie and of course, Hailee! That's a must-have on my list too! What a blessing it is to be on your blog today!You are such a gracious host and I appreciate your friendship as well. I am honored that Kaydie is on your keeper shelf! Great interview. Thanks for sharing your writing life, Penny. And thanks for providing this through your blog, Joy. How nice of you to drop back by and for your nice comments. guess what Joy's Joy~Ful Journal is going to do in June? Okay, so you give up! Well, Joy's got an idea to do a Spring~Blog~Fest Summary and I'm going to bring all of you who so kindly submitted to my inquisitions and one extra lined up for a book blurb, book cover, author head shot and maybe each of your bios for one of the Tues in June. I'll get back with you about it but that's pretty much the scoop - Be ready to check it out! Blessings, Eddie on this Resurrection Weekend and celebrations! Joyfully grateful for your support of this blog! Thank you, Eddie, for stopping by Joy's blog and for your kind comments. Joy is such a blessing and I so appreciate her willingness to help promote other writers.